This unique weapon is carried by the Dremora Lord Dregas Volar in Magas Volar. 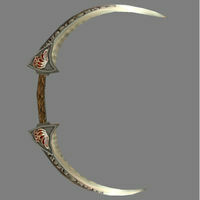 The Daedric Crescent is reminiscent of the weapon in Battlespire, where it first appeared but was not usable. The only way to acquire this weapon is to travel to Magas Volar using the Daedric Sanctuary Amulet.